Record-breaking results at the World Championships. Well done to everyone who took part in this year’s World Pilot Gig Championships on behalf of FMPGC. Ladies A broke the club record by finishing 18th overall out of 125 boats. Records were also broken by the Ladies Vets crew (10th), Ladies B (42nd), Men’s B (35th) and our Supervets (11th and 108th). Men’s A equalled their best ever finish of 3rd in the Veterans and came 11th in the Open event out of 120 – both fantastic results considering their need for a new bow rower after illness forced Biffo to pull out at the last minute. 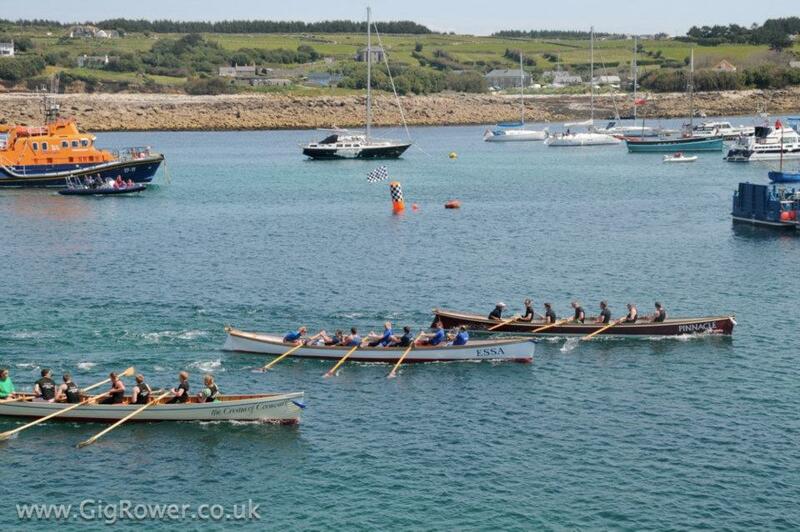 Ladies C finished 79th, with many of their crew enjoying their first ever Scillies. More reports to come in soon from the crew captains. Plus send Celia any good team photos you might have. A Concept 2 ergo arrived by courier on 7th December 2011, marking the start of this season’s training journey to the 2012 World Pilot Gig Championships. Our winter training regime would relentlessly consist of 7 ergo sessions a week, 4 boat sessions (often in the dark) and 1 or 2 gym/weights sessions. Training proceeded well, a boat full of brothers – Mark and Paul Smith in bow, and Andy and Paddy Blake in the middle seats. Neil Rogers and myself made the stroke pairing and we have rowed what feels like a million strokes together (and is probably far more than that). The crew was extremely tight and focused, developing a new style and endlessly reviewing performance data. We were confident that we could have done little more to prepare other than giving up full time work! So, you can imagine the devastating impact that losing our bow man Mark to a lung infection just a couple of days before the World Championships had on us. Suddenly thrown into disarray, we had to find a replacement for the weekend, or even consider pulling out of the event. Our target before the event was to win the veterans class and reach the final “A” heat in the open class. After a number of short test rows out on Thursday and Friday mornings we decided on Paul Smith moving to the bow seat and Barry Churcher joining us in the 2 seat in preparation for the veterans race on Friday evening. A spectacular and well fought race, close all the way to the end but it saw us coming in 3rd place (as in 2010 and 2011!) to Roseland in 1st and Caradon in 2nd. Just 6 seconds separated the first three boats after over 15 minutes of racing. Interestingly Barry’s brother, Nigel, was stroking the 2nd placed crew. 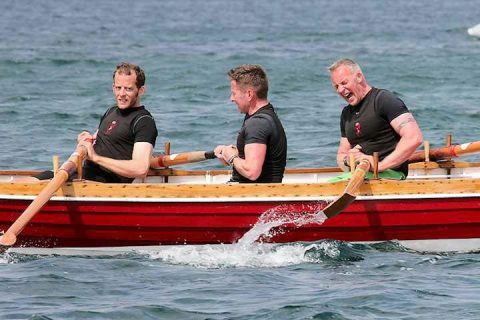 The open class races started on Saturday afternoon and by then we had managed to scour the islands and find a replacement bow rower, none other than Greg Oldrieve. This proved to be an inspired choice with Greg quickly adapting to our style and we crossed the line in 11th from 120 crews on the long “seeding” race and putting us in the “A” group. The Saturday afternoon race is the first of the shorter “sprint” rounds and we again finished 11th from the 12 crews taking part which meant we dropped to the “B” group along with Caradon’s B-crew in the gig Essa and were now lying 13th overall. We knew Sunday morning would be a major challenge and our chance to move back up to the “A” group and be able to race in the “A” heat final on Sunday afternoon. Sunday morning round 2 sprint – another epic struggle, one of the best races of the weekend. The gig Essa leading for half of the race with ourselves in Pinnacle, then Tregarthens and Cream of Cornwall. We stuck to our race plan and pushed to start to take the lead in the last 1/3rd of the race. Pinnacle was overlapped but ahead of Essa and with Cream of Cornwall pushing very hard in 3rd place with 60 strokes to go, Cream of Cornwall put in a huge burst and for a time I thought they would come right back into the race and take 2nd place from Essa. We held firm, and crossed the line ¾ of a length up on Essa. Suddenly the “A” final beckoned. Despite everything, we’d made it! The final heat was a blur. Paul wanted to stop by the “VIP lounge” beach at Tresco and it gave us a chance to catch our breath and check the boat over. In no time at all we’d started and covered most of the course. When our coxswain, Tracey Rickard, called the “100 to go”, it felt like we’d only just settled into our stride. Another great race and we finished 11th overall in the fleet. Overall, one of the best WPGC’s ever, we hit the target of getting into the “A” final and psychologically ended up one of the best prepared crews on the water. It was sometimes hard during circuit training, rowing at night or sitting on a beastly ergo, to remember why we were putting ourselves through such torture. It became apparent last weekend. Race one was started in an easterly wind and under overcast sky. The start of the race was busy and the race was a hard one with rough seas and a competitive line up. Our outside berth meant that we had a good amount of chop throughout the race (perhaps we should rename the boat Aardvark?) however we were placed a respectable 24th in the first round and we were delighted to be, by the skin of our teeth, in the B heat. The second race was under similar conditions and to our delight we maintained our place in the B heat and crept up a few places to 17th overall. Sunday – what can I say? It was beautiful. The start line was amazing with people singing and laughing and it was a fantastic atmosphere. The race was frantic and exhausting. It was keenly fought, Nat driven by a desire to beat Jodie who was an excellent competitor all weekend. We had a deal to ease up if our place in the heat was safe. The racing was so close it was impossible to let up for a second and even on the finish line we were unsure where we had finished. The last race was undoubtedly our best. We agreed universally that everything came together for us and we really enjoyed this race. It was again a closely fought race, brilliantly coxed by Neil. Our overall position of 18th we felt, is a reflection of our hard work, the endless hours of coxing by Neil, the punishing but brilliant training programme put together by Penny and the amazing support we received from everyone who was there. What a fab weekend. Thank you everyone. Throughout the long weeks of winter training, Bridget, Hilary, Lynn, Liz, Marianne & I worked hard, knowing that, this year, we would be in the strong position of being able to enter both the veterans and open races in an unchanged line-up. About a fortnight before our last gig left for the islands, Bridget was unfortunately told that she was too unwell to race so we had to quickly adapt to two new stroke rowers, with Penny and Susannah saving the day and slotting in very well to replace her for the weekend. At least we had a couple more rows in which to practice with our subs than MA did with theirs! We were delighted with our result in the Veterans race on the Friday night which, in finishing 10th, saw us breaking the club record and qualifying FMPGC for a seeded place at next year’s event. John stepped in when Bridget finally (!) admitted that she was sadly too unwell to cox us. It was a closely fought race but we just pipped Golden Gear and Irene on the line, all of us having been up with the leading pack the whole way. Jeremy coxed us for both races on Saturday, getting us into an excellent (some might say ‘cheeky’!) position on the start line and steering us a great course to finish 44th in the long race from St. Agnes. The 2nd race that day saw us end up in 40th place overnight. We didn’t feel that we’d rowed as well as we could’ve – the nerves possibly getting to us and over-shortening our stroke. By Sunday we’d relaxed a bit more and we had a cracking final 2 races; rowing better than we had all weekend – even if the results stayed very similar! We finished up 42nd overall, just beating the club record from previous years by 1 place and once more just ahead of our weekend-long rivals from Devoran in Irene. The weather, crew camaraderie and fun that we had during the Championships made up for the setbacks we’d had over the previous fortnight. I was so proud of our crew’s ever cheerful spirit and commitment throughout the whole training & racing process. And now, despite our combined ages which took us very close to 300, I think we can justifiably throw off our self-imposed crew nickname of the ‘old boilers’ and can now call ourselves the ‘fierce badgers’ instead (or something like that -you had to be in the boat and I’m not repeating the whole conversation on here!). We had rowed only four times together as a full crew before heading off to Scilly, our thanks to all who filled in, either rowing or coxing to enable us to do our training! The Ladies round one and we were champing at the bit, along with a certain amount of trepidation! Two of our crew had never raced before and four had never been to Scilly but we did have the experienced Caroline and Jill to keep us on track. We worried some of our competitors with our warm up ballet arm exercises, great fun and it really did pull us together for the start of the race. Our cox Simon did a fantastic job in guiding us through a safe path and we were elated to finish in 72nd place. A challenging outside start position in round two led to a disappointing last place in that heat , but we regrouped for the final round and finished in the middle of the field which we were really pleased with. The whole weekend was fantastic, we gained some great race experience by working together as a crew and we really enjoyed every minute and all want to do it all over again! Each of the last 4 years the supervets have improved their result at the Scillys (based on bizarrely just how many gigs finish behind us). Although we did have that Senior Moment which ‘of course was never ever our fault’ in one of the group races, the results were, 14 behind in Vets, 16 in the Mens St. Agnes race and we did win one group race so we finished in a higher group than previous years. Angus was missed ,so we downed a bottle of bubbly and scotch at the finish whilst waiting for the others to catch-up, and yes we still did manage the Mexican Wave! and as usual we enjoyed ourselves.